“The Dinner” is a riveting, provocative, and complex film, one that will challenge audiences preconceived notions about a great many subjects. It’s not easy to watch, nor is it meant to be. The actors’ performances in the film, particularly that of Steve Coogan, demand your attention, as the characters’ actions can go from potentially sympathetic to alienating and even horrifying in the span of a few minutes of screen time. Ultimately, it’s a film meant to elicit thoughtful and challenging conversation about difficult subjects; a little ironic, considering the plot revolves around a family conversation about an ugly subject that quickly abandons civility and, depending on one’s point of view, even basic humanity. Audiences experience most of the film through the eyes of Paul Lohman (Coogan), a former history teacher who loathes his older brother, Stan (Richard Gere, “Arbitrage“). Stan appears to be everything Paul is not: polished, comfortable in crowds, a born politician and successful congressman running for governor. Paul’s reasons for hating Stan go back to their childhood, and it’s a hatred he has little intention of letting go of anytime soon. Thus, the idea of sitting down to an obscenely expensive dinner at a pretentious “food presented as art” restaurant with Stan and his wife Katelyn (Rebecca Hall) could not be more abhorrent to him. Paul’s wife, Claire (Laura Linney), is more practical, however. She sees a rare opportunity for a dining experience with people who rarely reach out. Plus, something’s happened that necessitates a conversation with Stan and Katelyn, something involving Paul and Claire’s teenage son, Michael (Charlie Plummer). The occasion starts to go wrong almost from the minute the four sit down in the restaurant. But the opening shots Paul sends across Stan and Katelyn’s bows are just the aperitif, the first course in a night full of difficult revelations and confrontations. By the time the real reason for Stan calling them all together comes out – the very same occurrence Claire wanted to talk to them about – everyone is on the defensive, and no one is ready to give an inch. But a heinous crime has been committed, and something must be done, or all their fortunes as well as those of their children could be ruined. “The Dinner” is based on a bestselling novel by Dutch author Herman Koch. The film follows Koch’s narrative structure faithfully – as it was in the novel, the film is divided into dining courses, with titles like “Aperitif” and “Main Course” appearing on screen at various points. However, the film progression is barely linear. Yes, it does move from course to course in the order you’d expect, but the backstory, the reasons behind all the tension at the dinner table, are revealed through a number of flashbacks. As constructed, the film is likely to test the patience of even the most ardent film lover, but that seems intentional. Everyone at that table is impatient for their own reasons, and thus it’s important for audiences to feel vicarious sense of that anxiety. Put another way, the film makers seem to want audiences to feel like they wouldn’t want to be there, either. Arguably, they succeed. 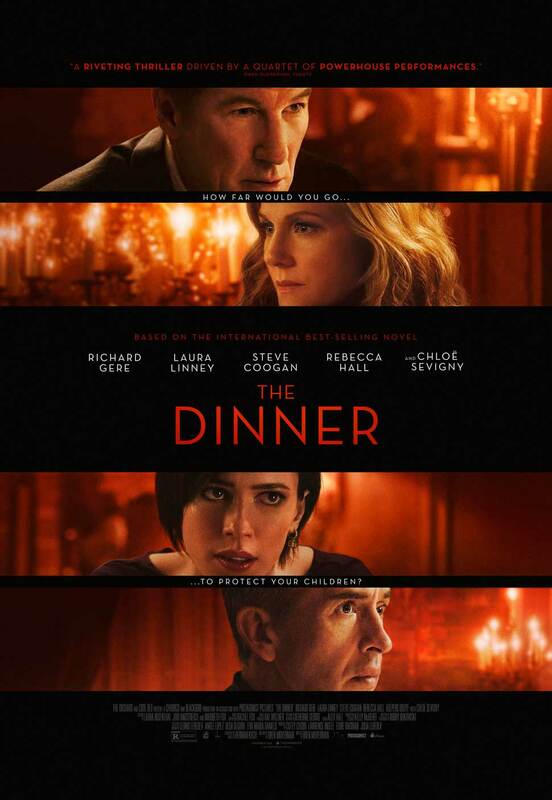 Though Gere gets top billing among the cast of “The Dinner,” and his performance is a strong, believable one, it’s Steve Coogan’s work in the film that’s the most mesmerizing. As the character is in the novel, Paul is an “unreliable narrator” – audiences relying on his perspective on the story’s events as they unfold learn that his perspective is, in fact, unreliable. To make such a character work, an actor must first earn the trust of an audience to set them up for that unpleasant realization later on. They must be sympathetic in some way, have some element to them that’s easy to connect to at first. For Paul, that element is Stan. In our world today, it’s easy to understand someone’s hatred for a politician, especially one seemingly blessed with good looks, charm, grace, and a beautiful, much-younger wife. Laura Linney’s delivery of calm, collected, devoted Claire also helps with the sell on Paul. She projects an understanding of a Paul that others don’t see, one that should prompt a viewer to give him the benefit of the doubt for longer than they might otherwise. But “The Dinner” works, in part, because at some point every character – not just Paul – earns that benefit of the doubt, and at some point, they all lose it, as well. This talented foursome of actors all at some point make these characters and their stake in what happens next so fascinating that you have to keep watching, no matter how much you might wish to be doing anything else. Perhaps for that reason alone, it should not be missed, especially by audiences who wish to put off the onslaught of loud, expensive action extravaganzas that fuel the summer box office just a little longer. Just one last warning. This is not an easy movie to watch, right down to the ending. But it is a memorable one that’s worthy of your attention … if you can stomach it. Starring Richard Gere, Laura Linney, Steve Coogan, Rebecca Hall, Adepero Oduye, and Chloë Sevigny. Directed by Oren Moverman.